Kentucky Agriculture Commissioner James Comer said yesterday that restarting hemp production in the state is his top priority for the legislative session that begins in January. The first-term Republican and former House member told the Interim Joint Agriculture Committee that he will push for a legislative resolution urging the federal government to revise its drug laws to allow production of industrial hemp, which advocates call the version of cannabis sativa that is grown for fiber. Comer revived the Kentucky Industrial Hemp Commission, which had been dormant for nearly a decade. U.S. Sen. Rand Paul, R-Ky., is giving the commission $50,000 from his political action committee, and Dr. Bronner's Magic Soaps company in California is matching that amount, The Courier-Journal of Louisville reports. Hemp is native to Kentucky and was a leading cash crop for the state in the 1800s, but with the growing use of it for marijuana, the crop fell from favor and was outlawed by Congress in 1937. Hemp only contains trace amounts of THC, the hallucinogenic chemical in marijuana, but because it is same species as plants grown for marijuana, the Drug Enforcement Agency has authority over it and U.S. hemp production is virtually nonexistent. Hemp can be used to make a wide range of products, from clothes to twine to fuel. The Hemp Industries Association estimates that retail sales of hemp-based products was more than $452 million in 2011. 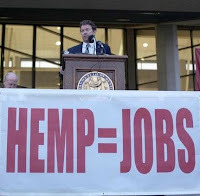 Paul co-sponsored a bill to legalize industrial hemp, but the issue hasn't gotten much attention in Washington, Janet Patton of the Lexington Herald-Leader reports. Despite this, there is widespread support for hemp production in Kentucky, Comer said. 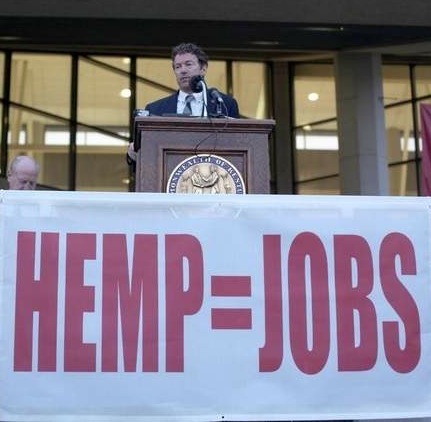 He says it would provide much needed jobs to Kentucky farmers and help businesses who could use hemp to create products. "We just want the freedom to be able to grow a crop that we know will grow well in Kentucky," Comer said. UPDATE, Nov. 28: The sheriff of Christian County, one of Kentucky's largest, endorses Comer's plan. UPDATE, Dec. 8: Comer told the Kentucky Farm Bureau convention that support for industrial hemp is increasing, and the new Senate Agriculture Committee chairman said he would call Comer's bill for a vote, but the state police commissioner told The Associated Press that he continues to oppose it.